Few weeks back I got a requirement to setup a highly available API server. I said not a big deal! I'll have Nginx as a reverse proxy(Why not directly exposing API via ELB a different story) and my API auto scaled setup will sit behind an internal ELB and things would be in place TA DA. Things worked perfectly fine for few days, but one day the API consumer reported that they are not getting response back, what? When I checked the API url was indeed returning a 502 error code. It was really strange for nginx to be sending 502 response back that meant the highly scalable setup was down? Well I was proven wrong ELB was working perfectly fine as the curl request to internal ELB was returning proper response, so yes the highly available API setup was in place. What next, yes! Nginx error logs. I did saw Nginx reporting connection timeout with 502 error code. The interesting thing to note that it was an IP(random IP assigned to ELB), when I tried to do curl hit on that IP for API request, it did failed EUREKA EUREKA!! I reproduced the problem. Well now I've to collect all this information and infer what is the logical cause of the problem, and yes there are lot of smart people available who would have fond the solution to this problem so I've to ask right question in Google :). The question was "Nginx using Ip instead of domain name" and the answer was "Nginx caches the IP at the startup and obviously as ELB is Elastic in nature so it's IP changes over the period of time". That was the reason Nginx was trying to talk to the older un-associated IP's of Internal ELB. 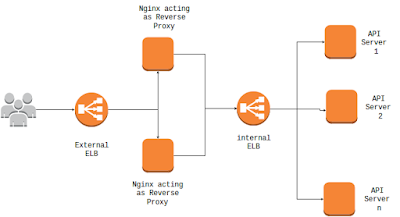 Finding solution was not a big task as it was just about making sure Nginx should talk to ELB not the IP's associated with it, that's why said marrying nginx with ELB :). I'll not go into the actual solution as there are already solutions available in web. I referred this really good blog as a solution.